It's hard to believe this year is already coming to an end! But these will be the last things I've added to my stockpile for packing shoeboxes in 2017. 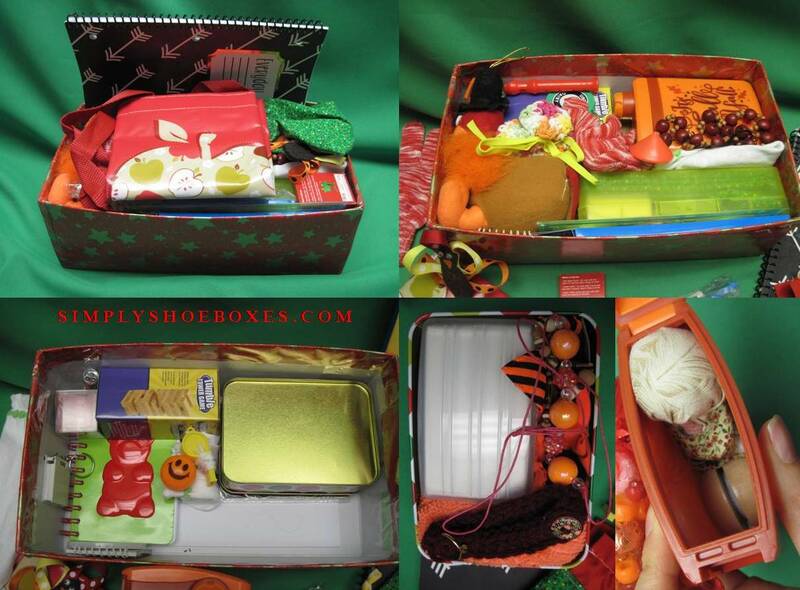 I have my mom some shoeboxes items as a gift...mostly theme items for theme boxes she is working towards. I also hit Dollar Tree's 50% off, and picked up some fun things. Jingle bells out of which to make necklaces. Some fun pencils, and of course stuffed animals! And some zippered plastic bags for when we take things out of packaging or bagging our crayon boxes in case they get too hot. I also at Freds, got some holiday items at 50% off, and some other clearance at 75% off. Loved finding leather gloves for the 10-14 boy boxes. I was very excited that my grandparents picked up some of the Office Depot Clearance deals for our shoeboxes, plus a couple other goodies. Someone from church also gave me some things they had gotten for shoeboxes, but decided to have me use instead. 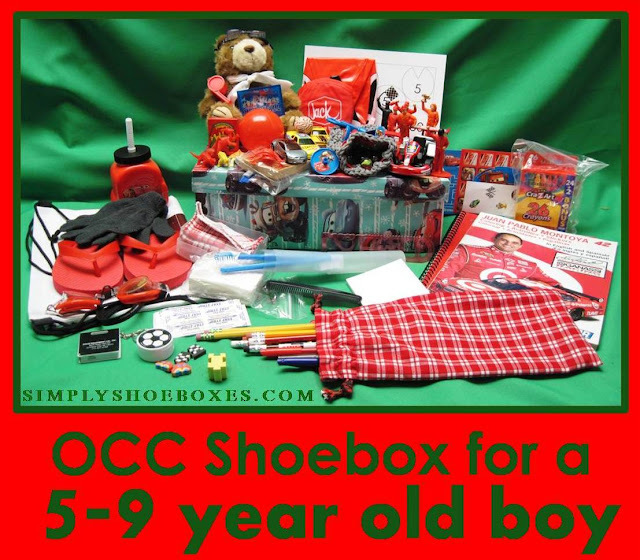 When I pack shoeboxes for Operation Christmas Child, I like to try to make them as personal as possible so even if I pick a good number, I don't lose sight of the individual child for whom I'm packing it. One way I try to make them personal is through themes. 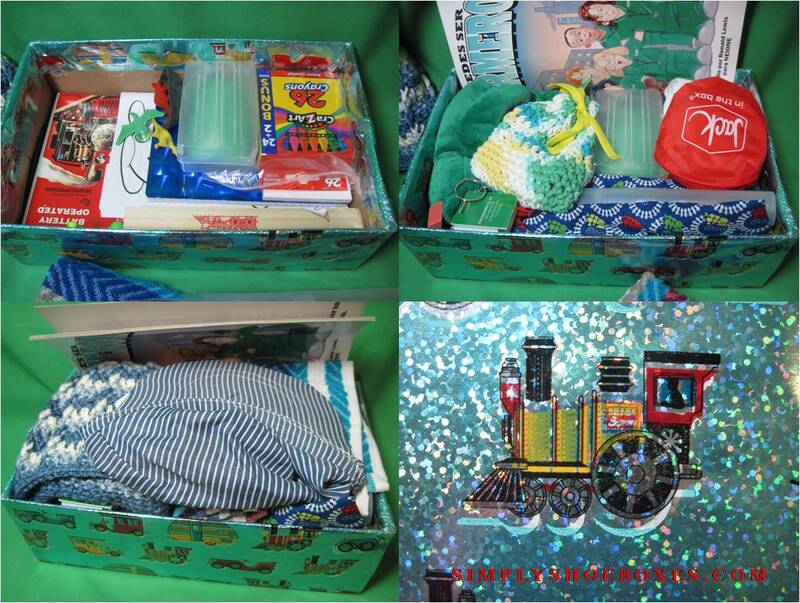 This was a very special theme one I did this, trains for a boy between 5 & 9 years of age. It all started when I found a battery operated train set, new in package at a thrift store for $1. I sent a couple sets of batteries, but I think it'll still be fun after the batteries run out. Then I made a theme out of it! I had quite a bit of fun with it! I had a crocheted hat that looked like conductor colors, then found an actual toy conductor hat! My mom made a Simple Lined Drawstring Bag out of train cloth that I used as a pencil case. I also had a train whistle and a plastic whistle shaped like a train. I used a normal shoebox-found one that the train fit just right in the bottom of. It was 350 cubic inches compared to a cardboard OCC GO Box that is 306, so pretty close in size. Plus, I was able to use wrapping paper that had trains on it along with some cars. This theme was special to me as over the years our family history is pretty full of trains! I don't think we have any engineers, but have, over the generations, had brakemen, linemen, conductors, workers in the shops-including a master mechanic, and someone who owned land that had stations built on it. I was trying to decide on a stuffed animal and I found this Irish/St Patrick's Day bear-PERFECT since the first train worker in our family was an Irish immigrant who built train lines, and I doubled down on it with Irish Spring soap-haha! Often people find it helpful to see how I pack the box to fit everything in, so here's some photos of that...plus a cute train from the wrapping paper. 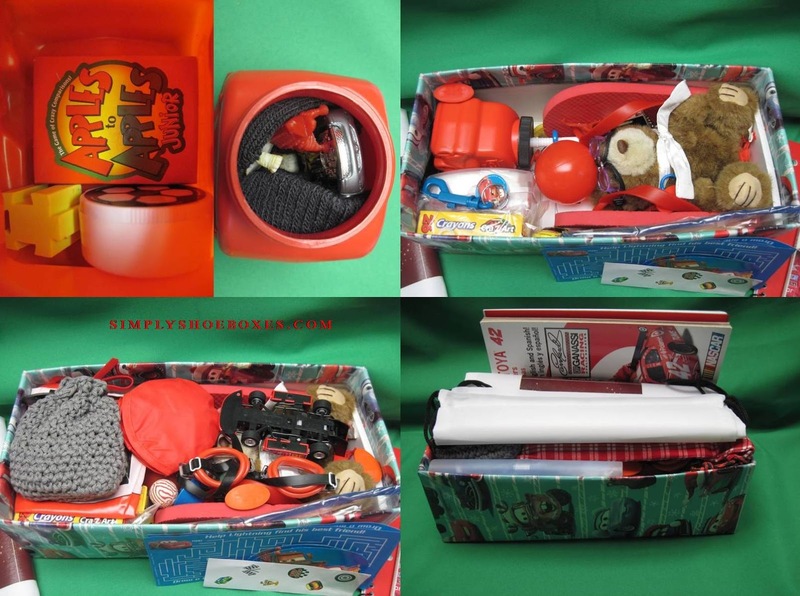 For more ideas/fun boxes, check out other shoeboxes we packed for 5-9 boys or our themed boxes! We finally got all of our Cyber Monday order-notebooks for a quarter, compasses for 50 cents, and a building toy for a dollar! I also found socks buy 1 get 3 free at Might Dollar-so 4 for a dollar! They're really cute and fun! They are fold over dress socks like I had when I was a little girl, but with little flower or butterful bead charms. Plus a couple other things. I also got some bar soap free after coupons (love having $6/$3 email coupons when I have other items to get) and ECBs. I also ordered from EAI education after seeing it suggested on the Pencil Granny Facebook page. Got a few fun things to try out-I think I'll do a review post. My mom and sister have also been getting crafting done, and I haven't been keeping up on sharing photos! 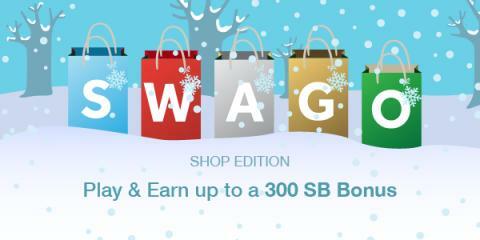 Hats and tote bags! ...plus the un-calculated savings through crafting! 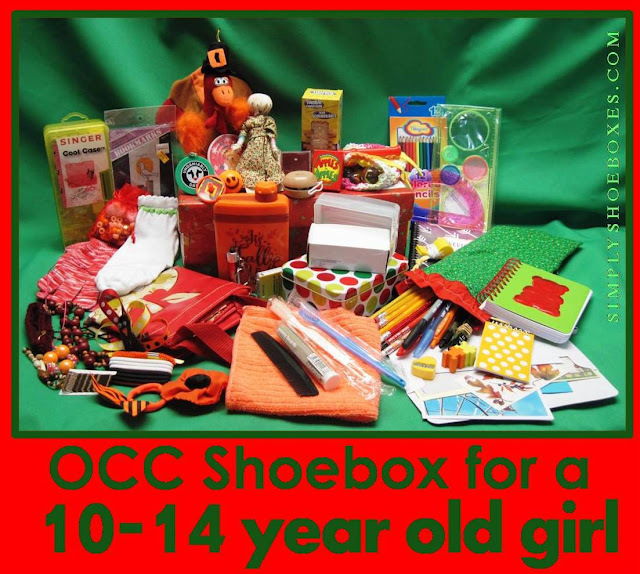 Here's one of the Operation Christmas Child shoeboxes I packed for a 10-14 year old girl this year. As with most of my boxes, it ended up having a theme-not a planned on, it just came together that way. It was fall/Thanksgiving-my favorite time of year and holiday! 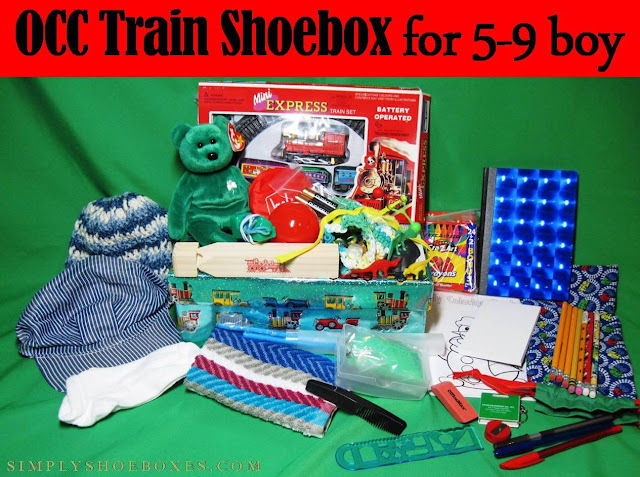 I used a normal shoebox, that was 386 cubic inches compared to a cardboard OCC GO Box that is 306, so pretty close in size. The wrapping paper was red with starts-great for both holidays! If you'd like ideas for other ages be sure to check out my posts on OCC shoeboxes from this year for: Girl 2-4, Boy 2-4, Girl 5-9, Boy 5-9, & Boy 10-14 (will be updated with links as I post those boxes, until I do, here's a link to all the shoebox examples posts). Here are more examples of shoeboxes for 10-14 year old girls if you're looking for more ideas! I stopped at CVS and got a couple toothbrushes free after coupons and ECBs, and the 7 in 1 game set was on sale for $6.99, and I had a $6 off $30 coupon, and since I was picking up some other things, I got it for $0.99!! What a great WOW item!! I put the chess pieces in an organza bag we'd been given recently for shoeboxes-all 7 games fit the case decorated to look like a domino that should fit great in a shoebox! While my sister and I were out shopping for last minute things for the youth packing party, I found this spirograph type ruler-fun!